If you are a chili fan like me, you will LOVE this roundup. 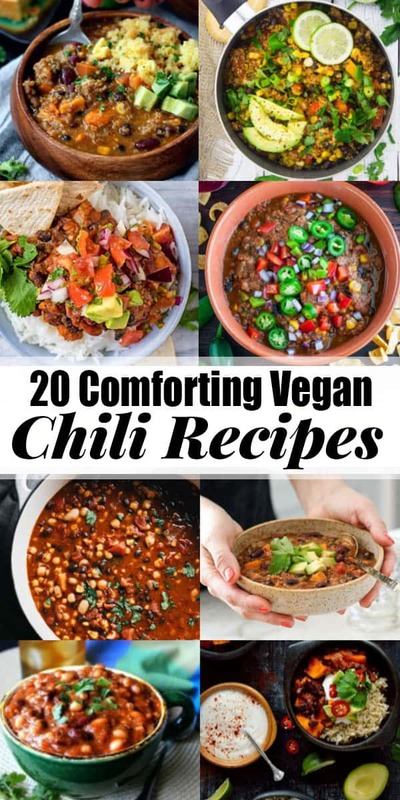 It includes 20 amazing vegan chili recipes that are perfect for quick and easy vegan dinners! Healthy, delicious, and super nutritious – all in one bowl! 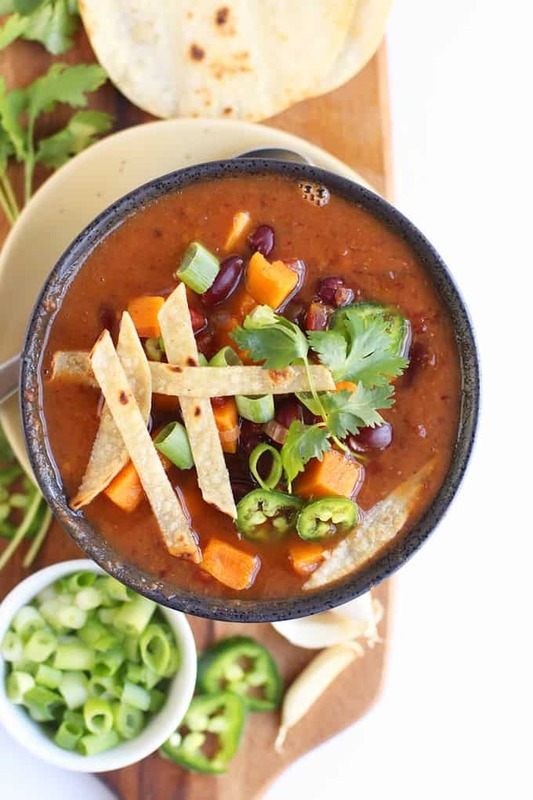 Now that summer is slowly coming to an end, I can’t get enough of easy vegan chili recipes! I mean they are just perfect for cold fall nights. Or actually for any time of the year. And they are great to use up leftover veggies as well. 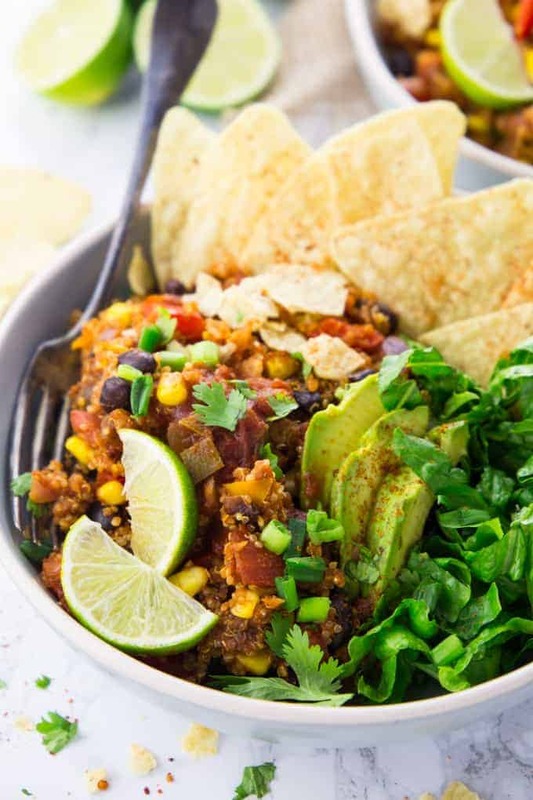 I hope you enjoy these vegetarian chili recipes as much as we do around here! What is your favorite? And what is the best vegan chili you have ever had? 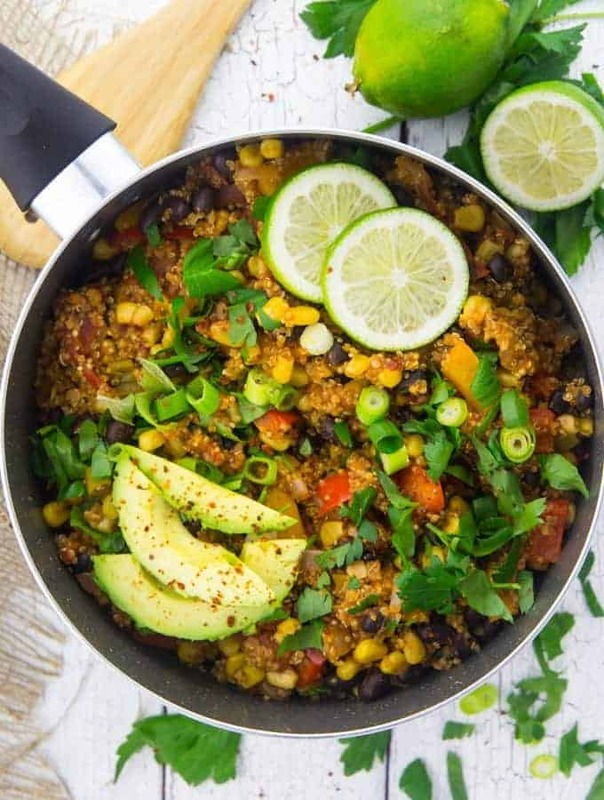 This one pan Mexican quinoa with black beans and corn is super easy to make, packed with protein, and so comforting! It’s the perfect dinner recipe for busy days! I love eating it with fresh parsley and avocado. 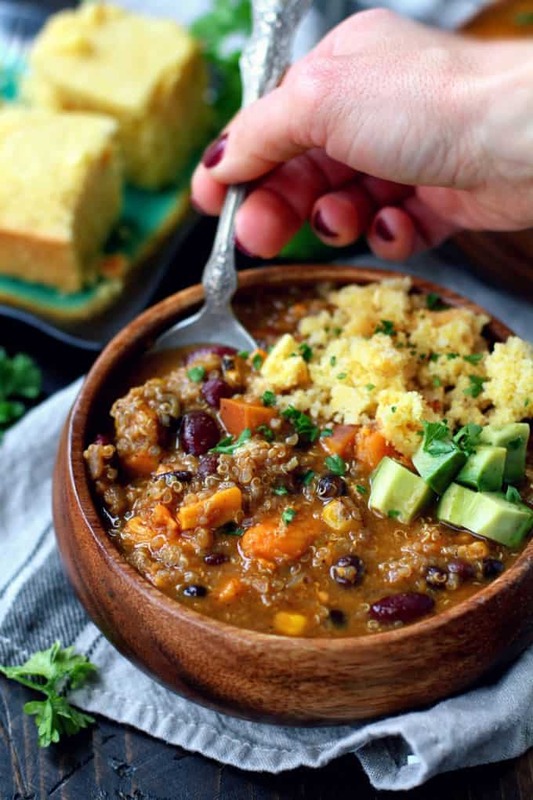 This vegan quinoa chili with sweet potatoes by Kim from Kim’s Cravings is the perfect comfort food. It comes together in less than one hour. And it’s super healthy and so satisfying! 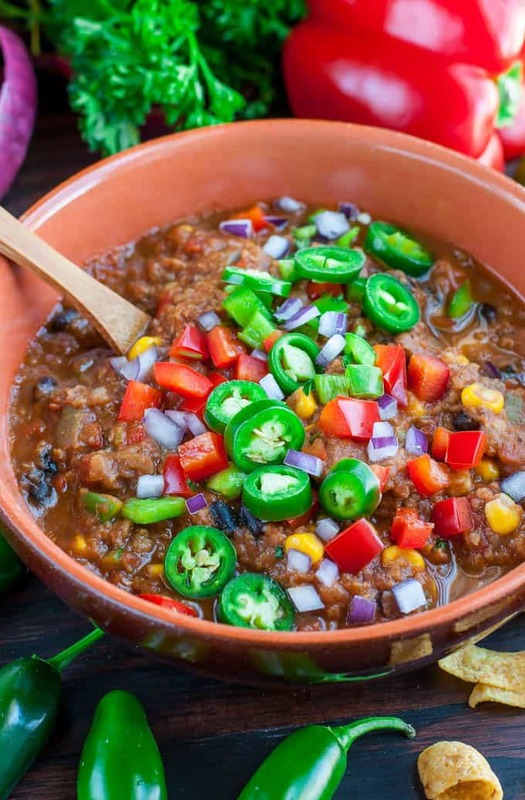 This vegan lentil chili by Jenn from Peas and Crayons is great for a busy day. You can make it in your Instant pot or in your slow cooker. However, Jenn also included a stove-top version. Either way, you will have a delicious and healthy meal with minimal effort! You definitely won’t miss the meat in this spicy vegan tofu chili with cashew sour cream! It’s super easy to make and packed with protein! It has been one of my favorite vegan weeknight meals for a long time. 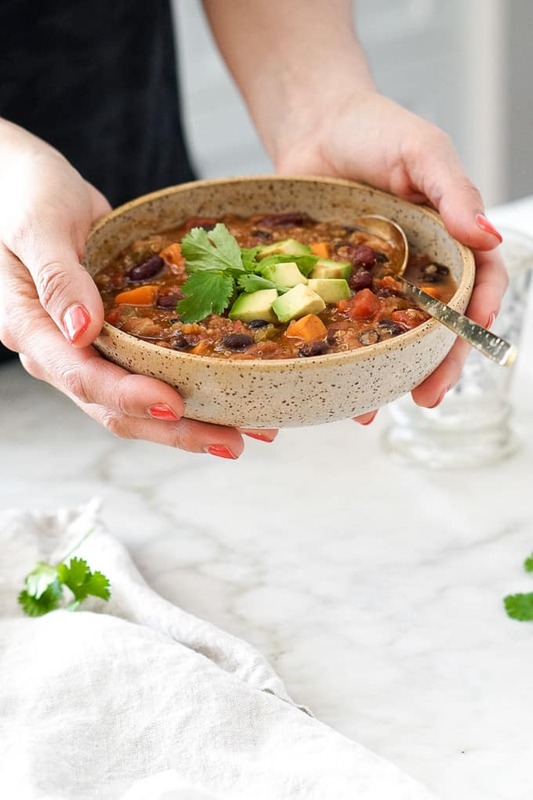 This sweet potato black bean chili by Hannah from Domestic Gothess is a hearty and warming meal that is perfect for fall days. And it’s also pretty easy to make. Serve it with rice, avocado, and vegan sour cream. 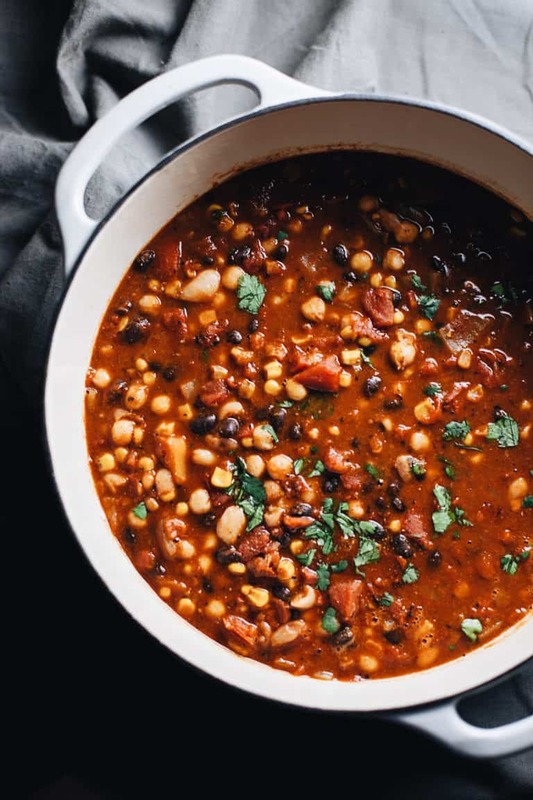 Make a big pot of this easy three bean chili by Bethany from A Simple Palate! Bethany used three different kinds of beans for this vegan chili, which makes it a real protein bomb! Add some tortilla chips on top for extra flavor and crunch. This burrito bowl with quinoa chili makes the perfect weeknight dinner. It’s super easy to make, healthy, and packed with protein. Besides, it’s vegan and gluten-free. It’s one of my all-time favorite dinner recipes! 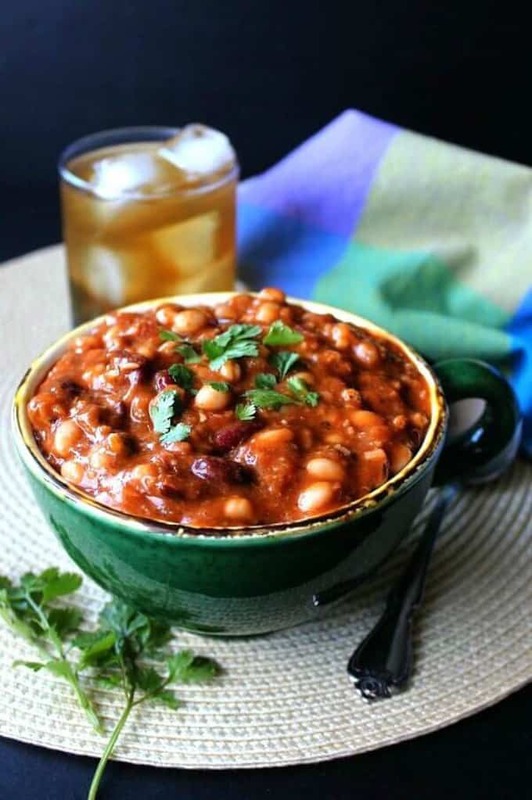 Doesn’t this crockpot slow cooker three bean chili by Bintu from Recipes From A Pantry look delicious? It’s gluten-free as well as vegan. And Bintu also included weight watchers points for those of you who want to lose weight. 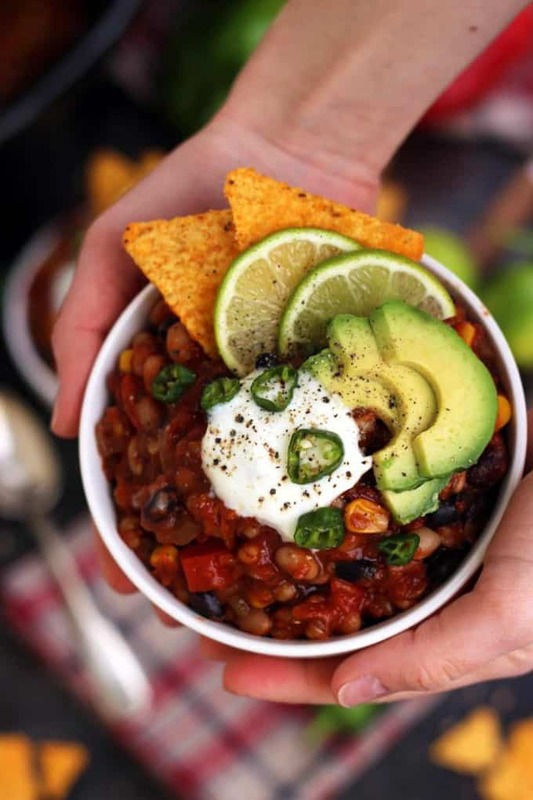 This homemade chili with mixed beans by Ginny from Vegan in the Freezer is perfect for every season! As Ginny says “every season is chili season”! It’s perfect for those cozy nights as well as for outdoor grilling. 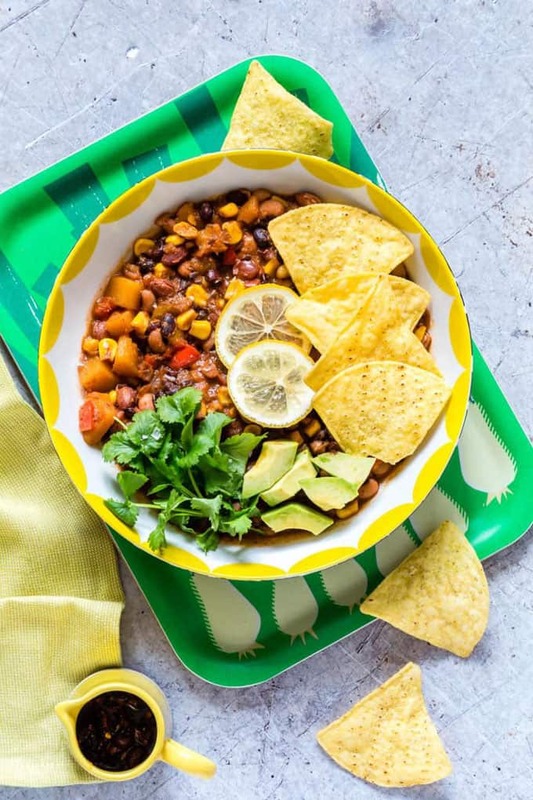 Dannii from Hungry Healthy Happy made this bean chili with avocado salsa for national chili day. I didn’t even know that such a day exists! Pretty cool! Her chili is low in fat while being high in flavor. Mary Ellen from V Nutrition and Wellness used jackfruit as a base for her vegan chili. For an extra boost of flavor, she decided to make the chili in a crockpot. It’s the perfect cozy meal for cooler weather. 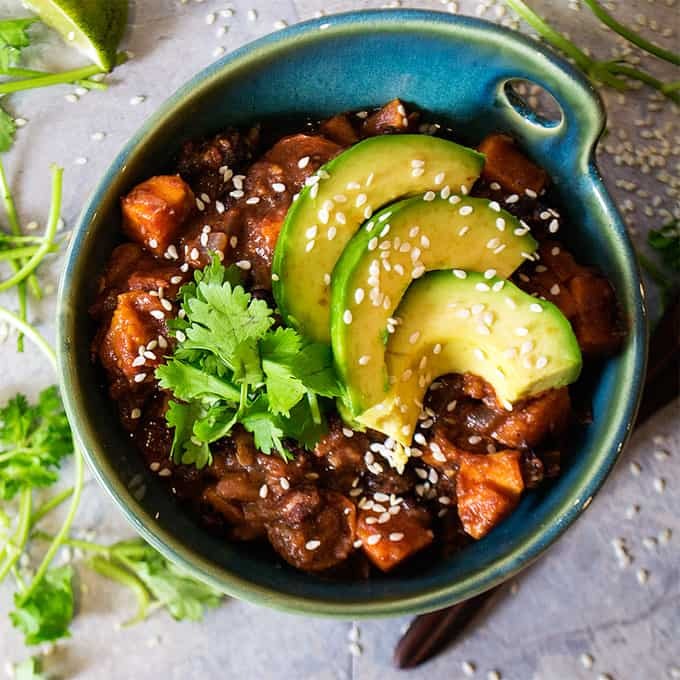 This slow cooker black bean butternut squash chili by Jenn from Veggie Inspired is perfect for any day of the week. It’s also great for parties or even game day! I love to make vegan chili in my Instant Pot. 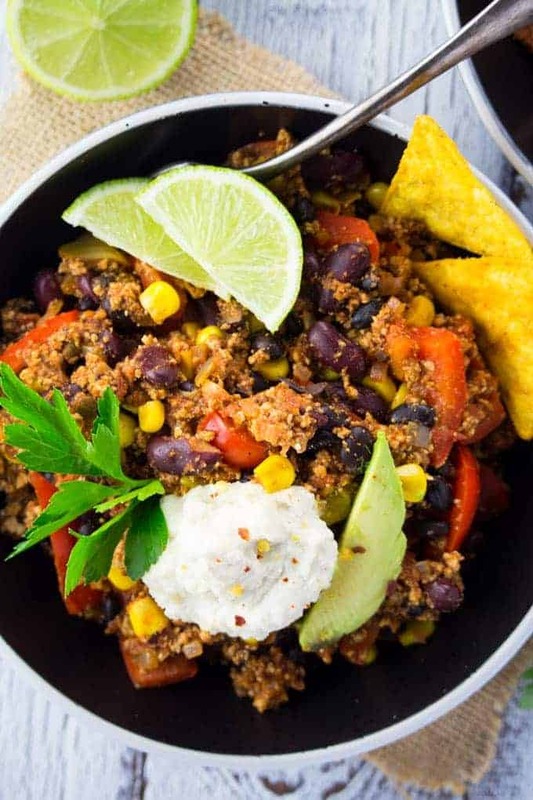 And I can’t wait to try this Instant Pot vegetarian chili by Marina from Yummy Mummy Kitchen. Doesn’t it look delicious? Top it off with some avocado and fresh cilantro for extra flavor and nutrients. 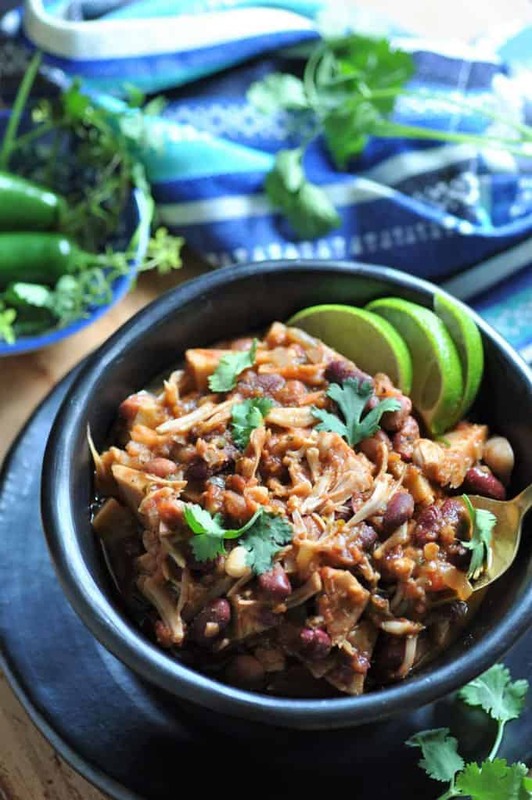 This Jamaican Jerk Chickn Chili by Linda from Veganosity is another delicious vegan chili recipes that uses jackfruit as a base. It’s packed with flavor and very easy to make. 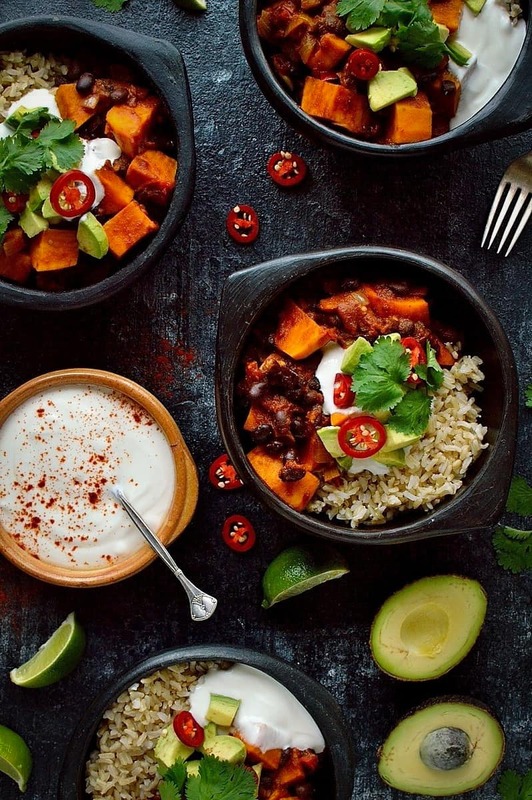 This vegan chili with sweet potato by Sarah from My Darling Vegan is perfect for fall! It make such a delicious vegan and gluten-free family meal. It’s made with sweet potatoes, kidney beans, and tomatoes. This sweet potato white bean chili by Emma from Plenty Full Vegan is so flavorful and healthy. Besides, it’s super adaptable. Instead of white beans you could also use chickpeas or kidney beans. Or try using other vegetables like butternut squash or zucchini. 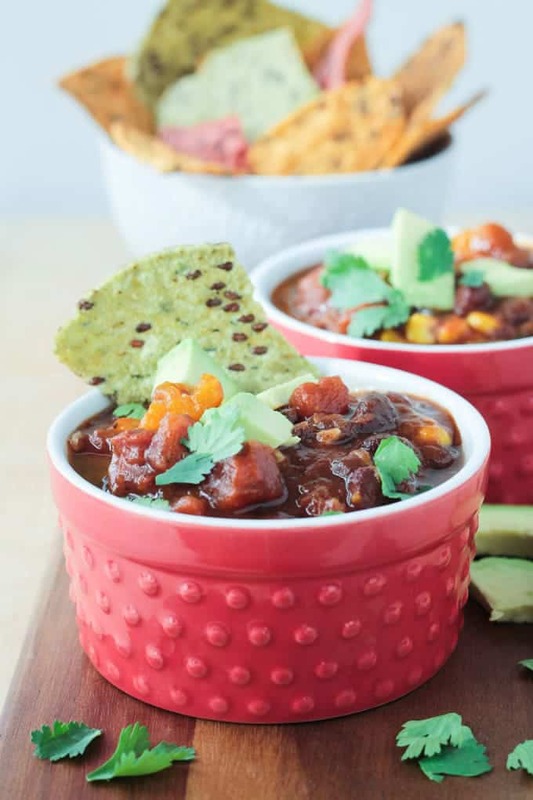 This slow cooker vegan chili by Sarah from Happy Kitchen Rocks is super delicious and easy to make. You can even make a bigger batch and freeze it so you have a healthy and comforting dinner ready in just minutes. 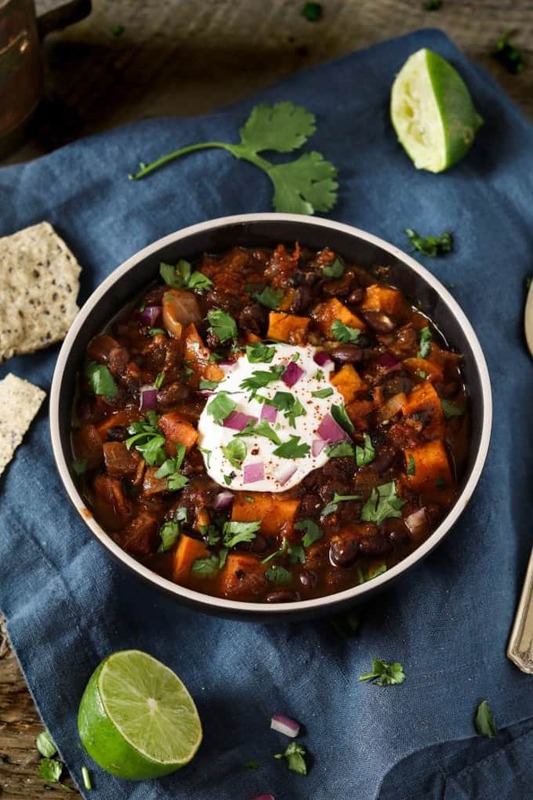 This Sweet Potato Black Bean Chili by Melissa from Vegan Huggs has the perfect balance of smoky heat and subtly sweet flavor. You could either serve it by itself or side it with rice or quinoa. Or maybe even with cornbread if you like. 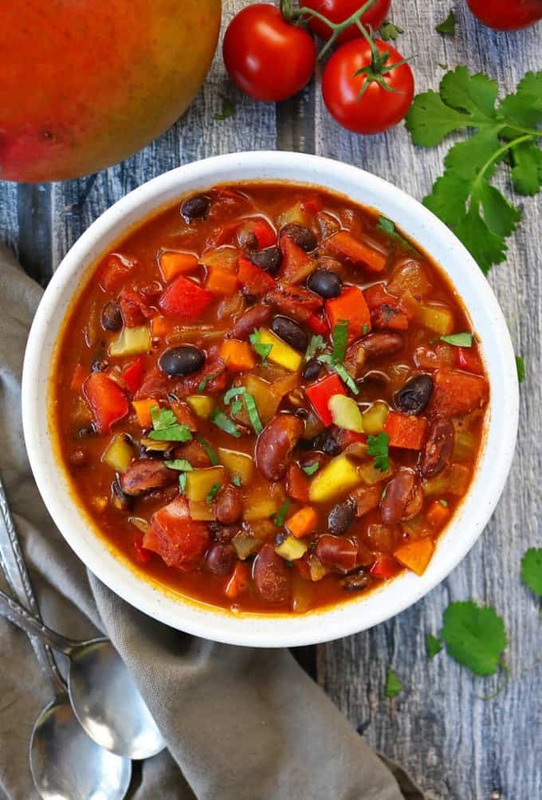 This slow cooker vegan chili by Sherri from Watch Learn Eat is made with tri-color bell peppers, three kinds of beans, and butternut squash. Easy and comforting! 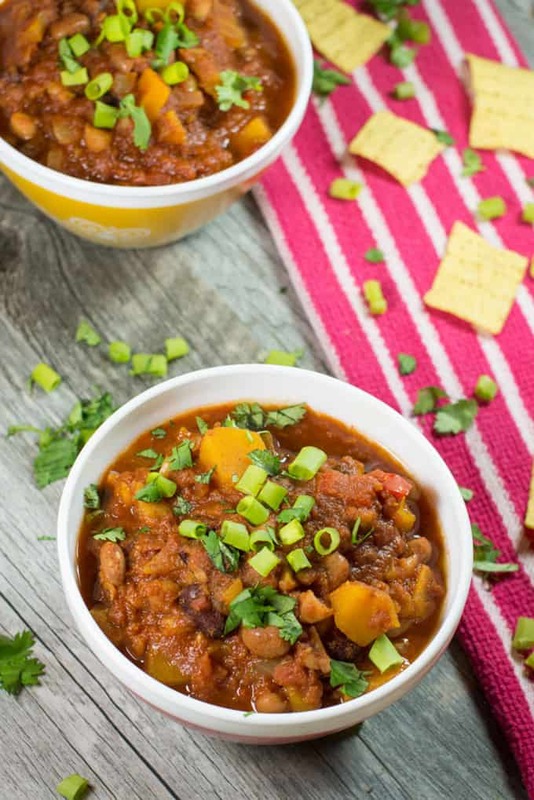 If you’re looking for a spicy sweet chili, then try this easy vegan mango chili by Shashi from Savory Spin. 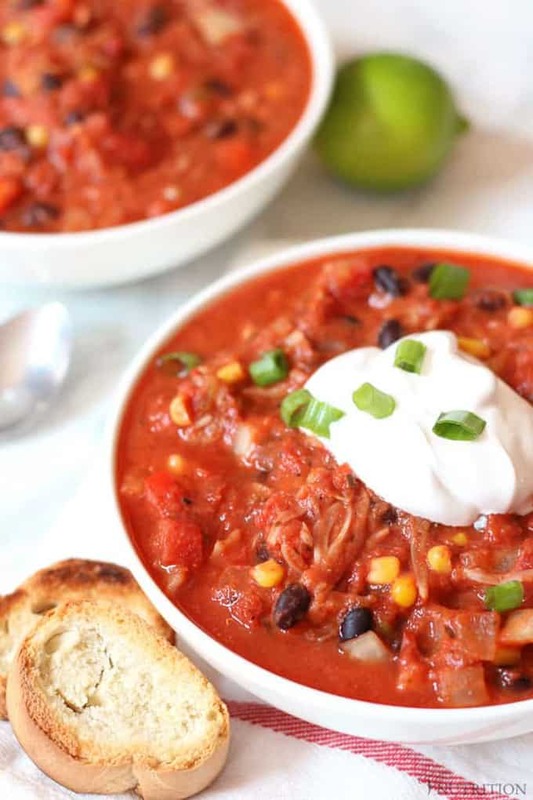 What a great take on chili! 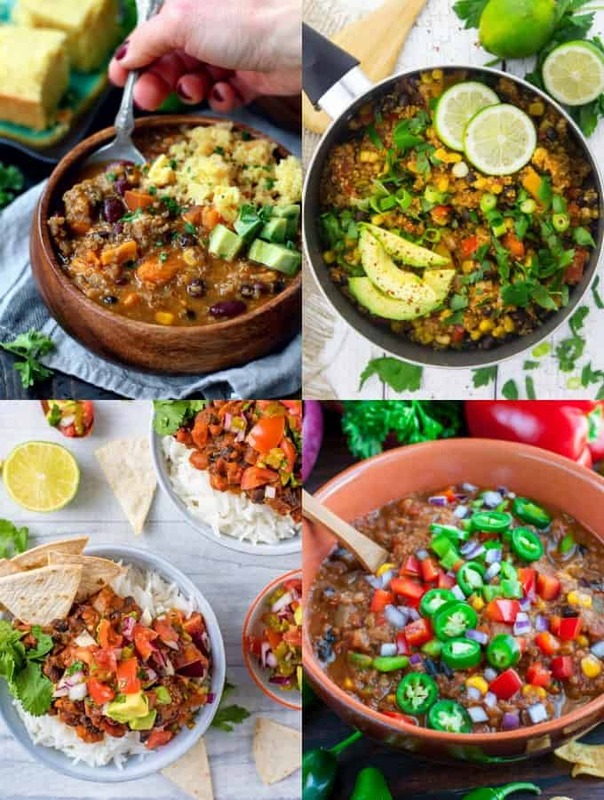 I hope you like these vegan chili recipes. 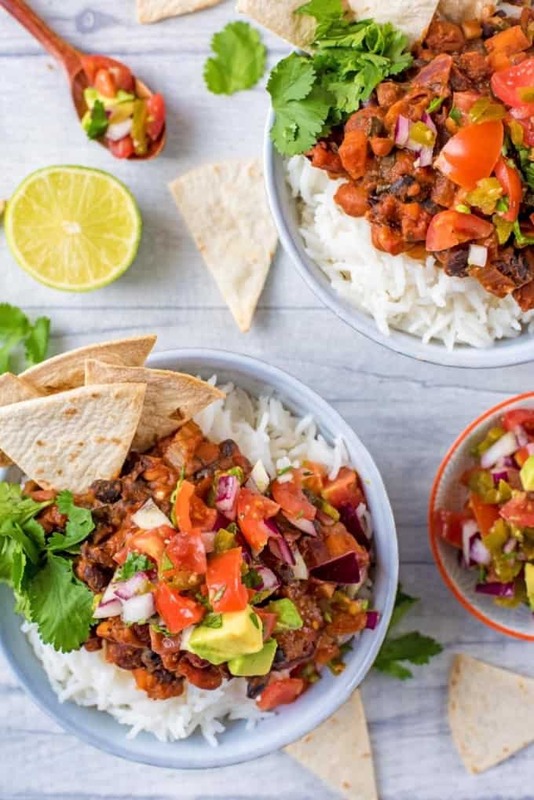 There are so many different ways to make vegan chili! What’s your favorite recipe? Bring on chili season! This is my favorite time of year – cooler temps, sweaters, boots, football, and alllll the cozy fall foods! Thanks for including mine!